Alva Community Council – Serving the people of our beautiful Hillfoots town. Welcome to the web pages of Alva Community Council. A new group of Councillors was elected in February 2013. It is our intention to use these pages to keep the community informed regarding our activities, as well as other events in the area. Please see our news section in order to be kept up to date, and also please click the Like button in order to be updated via facebook. 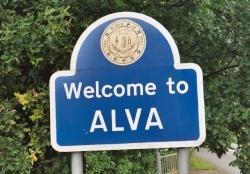 If you’re more of a tweeter than facebooker then you can follow @AlvaCommCouncil on twitter. Please see the Keep in Touch page for more ways to be updated on our activities. If you would like to help fund our community events fund then please consider making a donation using the donate button on the left. You can use credit card, debit card, or your paypal balance. Thank you. Our Community Action Plan consultation period closed on 8th June 2015, and the document published in October 2015. Thank you to everyone who has submitted a response either on line or on the paper survey. The plan is available to view and download here. Among our many activities is our administration of the microgrants that are available from EDF Energy. If your community project could do with up to £250 then please visit our microgrants page and submit an application.